, a man of wit and learning in the seventeenth century, was born at Fawsley in Northamptonshire, in what year is not mentioned. 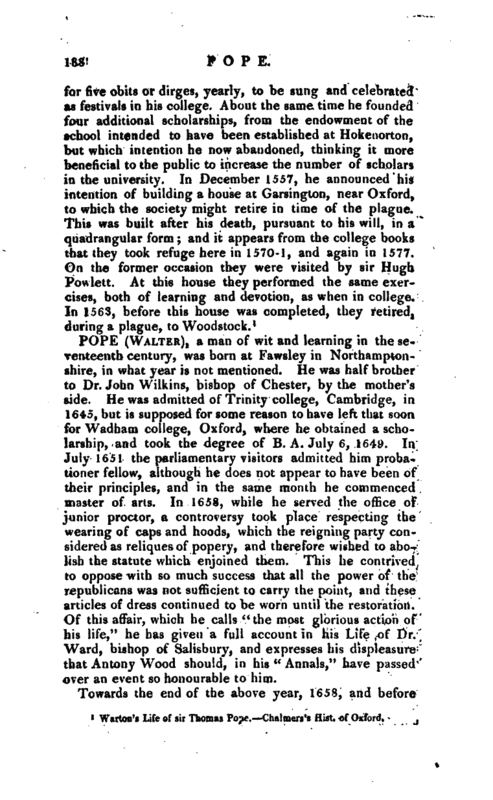 He was half brother to Dr. John Wilkins, bishop of Chester, by the mother’s side. He was admitted of Trinity college, Cambridge, in 1645, but is supposed for some reason to have left that soon for Wad ham college, Oxford, where he obtained a scholarship, and took the degree of B. A. July 6, 1649. In July 1651 the parliamentary visitors admitted him probationer fellow, although he, does not appear to have been of their principles, and in the same month he commenced master of arts. In 1658, while he served the office of junior proctor, a controversy took place respecting the wearing of caps and hoods, which the reigning party considered as reliques of popery, and therefore wished to aboJish the statute which enjoined them. This he contrived to oppose with so much success that all the power of the republicans was not sufficient to carry the point, and these articles of dress continued to be worn until the restoration. Of this affair, which he calls “the most glorious action of his life,” he has given a full account in his Life of Dr. Ward, bishop of Salisbury, and expresses his displeasure that Antony Wood should, in his “Annals,” have passed over an event so honourable to him. Towards the end of the above year, 1658, and before | his proctorship expired, he obtained leave to travel, but returned probably before 1660, as we then find him dean of Wadham college and when, in the same year Mr. (afterwards, sir) Christopher Wren resigned the professorship of astronomy in Gresham college, Mr. Pope was chosen in his room, and Sept. 12 of that year was created doctor of physic; but the statutes not permitting him to hold both, he was obliged on this occasion to resign his fellowship in Wadham. 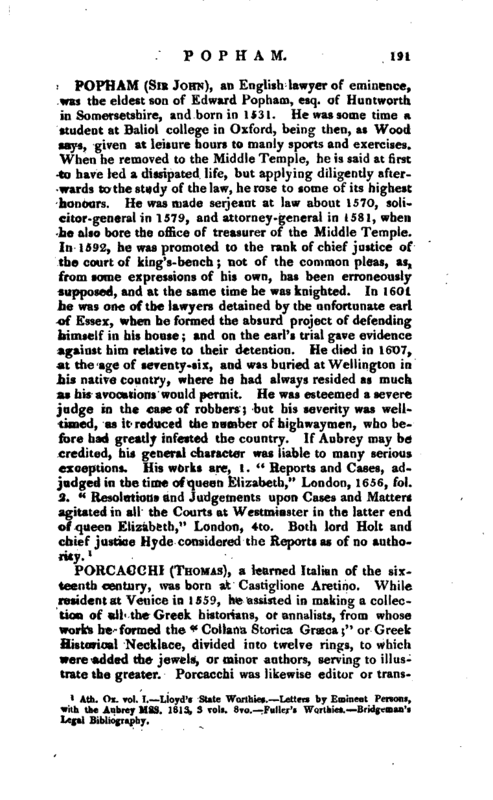 In May 1663 he was chosen one of the first fellows of the Royal Society along with the other eminent men whom the nation then yielded, and soon after had licence to travel for two years, during which he made the tour of Italy, and remitted to the Royal Society various observations collected on his journey. In 1667 he was chosen into the council of the Royal Society, and in the following year, his half-brother Dr. Wilkins, being promoted to the bishopric of Chester, made him registrar of that diocese. In 1686 he was recovered of an inflammation in his eyes, which endangered the loss of sight, by Dr. Turbervile, an eminent oculist, as he gratefully acknowledged in an epitaph which he wrote upon him after his deatii. In the following year he resigned his Gresham professorship. 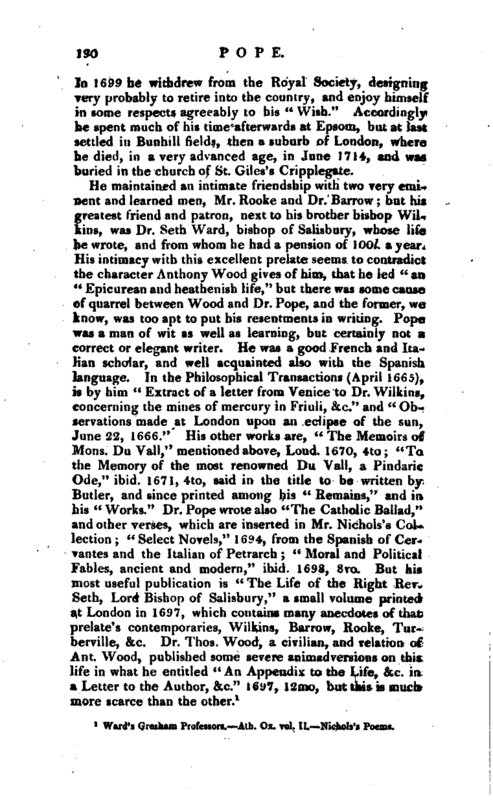 Dr. Pope was a man of humour and a satirist, and in both characters had published in 1670 the “Memoirs of Mons. 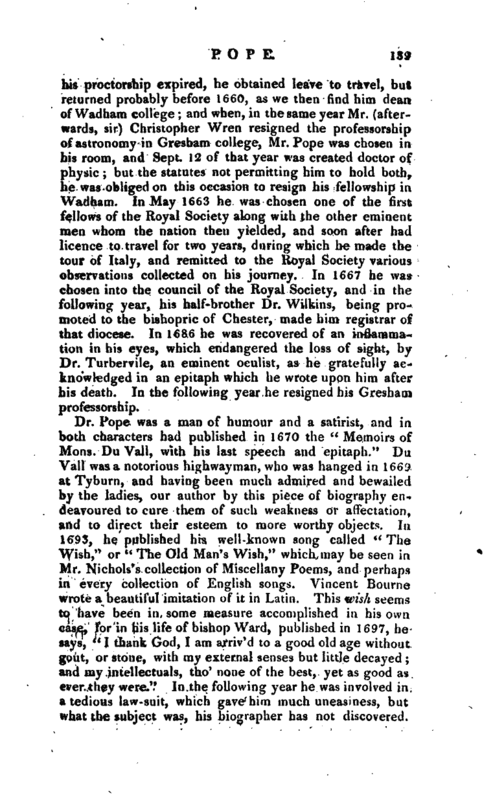 Du Vail, with his last speech and epitaph.” Du Vail was a notorious highwayman, who was hanged in 1669 at Tyburn, and having been much admired and bewailed by the ladies, our author by this piece of biography endeavoured to cure them of such weakness or affectation, and to direct their esteem to more worthy objects. In 1693, he published his well-known song called “The Wish,” or “The Old Man’s Wish,” which may be seen in Mr. Nichols’s collection of Miscellany Poems, and perhaps in every collection of English songs. Vincent Bourne wrote a beautiful imitation of it in Latin. This wish seems to have been in some measure accomplished in his own case, for in his life of bishop Ward, published in 1697, he says, “I thank God, I am arriv‘d to a good old age without gout, or stone, with my external senses but little decayed; and my intellectuals, tho’ none of the best, yet as good as ever they were.” In the following year he was involved in a tedious law-suit, which gave him much uneasiness, but what the subject was, his biographer has not discovered. | In 1699 he withdrew from the Royal Society, designing Yery probably to retire into the country, and enjoy himself in some respects agreeably to his “Wish.” Accordingly he spent much of his time afterwards at Epsom, but at last settled in Bunhill fields, then a suburb of London, where he died, in a very advanced age, in June 1714, and was buried in the church of St. Giles’s Cripplegate. Ward’s Graham Professors. —Ath. Ox. vol. II. Nichols’s Poems.